September 5, 2018 6:09 pm. Tough Larry lived up to his name in the opening race at Randwick’s Kensington track on September 5, 2018. Source: Bradley Photos. A horse carrying the colours made famous around the world by Winx has scored an emotional win on debut at Randwick. 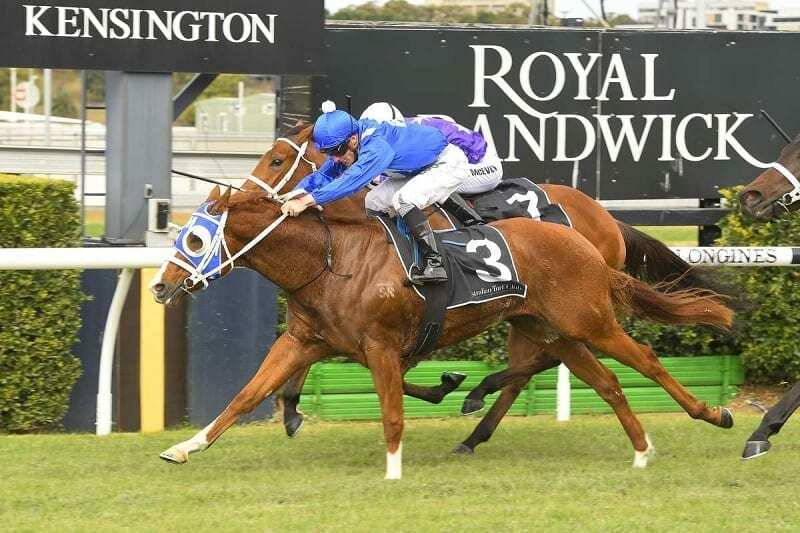 Winx’s co-owner Peter Tighe has a share in the Chris Waller-trained three-year-old Tough Larry and the gelding races his blue and white silks. His other owners include members of the Callander family, well known to racing, and the father and brother of the late cricketer Phillip Hughes. Former Channel Nine boss of NRL, Matt Callander, died last year aged 47 and Wednesday’s winner was named as a tribute to his nickname Larry. Ridden by James McDonald, Tough Larry ($4.80) beat his stablemate Voila ($5) by a half neck with another stablemate Altair, a $3.70 equal favourite, a further half neck third in the 1150m maiden on the Kensington track. “Larry was the nickname of my son Matt,” Callander’s father, respected racing identity Ken Callander said. Tough Larry’s jockey James McDonald said the gelding had a bright future. “He is a very kind and very willing and has matured mentally,” he said. At the other end of the experience scale, seven-year-old Prince Mayted has staked a claim for The Kosciuszko with his 1000m win on Wednesday. The $1.3 million race is for country-trained horses on The Everest program and Wauchope’s Colt Prosser believes the gelding deserves a chance. It was the ninth win for the 48-start veteran who has also recorded 20 minor placings. “There’s a real nice race coming up worth $1.3 million,” Prosser said. Tickets are on sale through TAB outlets and 12 will be drawn on September 14 with the winners to negotiate with the connections of horses they nominate for slots in the Kosciuszko field.